DynaMarker®DIG Labeled Blue Color Marker for Small RNA | BioDynamics Laboratory Inc. The DynaMarker® DIG Labeled Blue Color Marker for Small RNA is a pre-stained and digoxigenin (DIG) labeled molecular weight marker for small size RNA, suitable for denaturing polyacrylamide gel electrophoresis and blotting onto membrane. This product consists of colored and DIG labeled six nucleic acids, the apparent molecular weights of which are 20, 30, 40, 50, 75 and 100 bases of RNAs. This marker is suitable for monitoring denaturing polyacrylamide gel electrophoresis and for immunodetection with anti-DIG antibody. This molecular weight marker is suitable for monitoring electrophoresis and blotting onto membrane (see Figure 1). 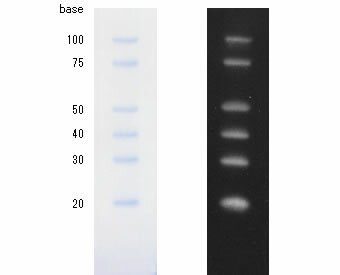 These pre-stained bands are able to be detected with alkaline phosphatase conjugated anti-DIG antibody and chemiluminescent AP-substrate (see Figure 2). Apparent sizes of bands in the marker are in excellent agreement with sizes of non-stained RNAs (DynaMarker® Small RNA II (DM192)), 20, 30, 40, 50, 75 and 100 bases bases in length (about 95 % accuracy). The marker is ready-to-use mixture. It doesn't require heat treatment or denaturing agents. Right : Electrophoresis profile of DynaMarker®DIG Labeled Blue Color Marker for Small RNA (2) 5 μg of Human Breast total RNA and (3) 5μg of Breast Adenocarcinoma (MCF-7) total RNA on 12.5 % polyacrylamide – 7.5 M urea gel / 1×TBE buffer as running buffer. 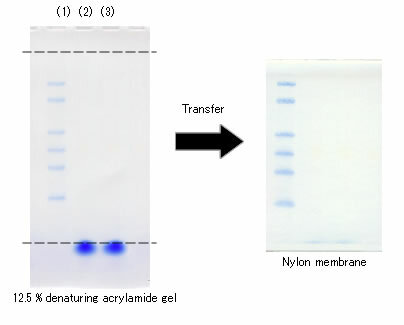 Blotting of (1) – (3) onto nylon membrane. 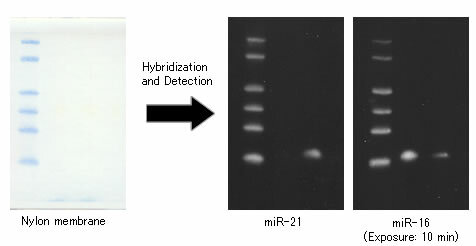 Hybridization of DIG labeled DNA probe to a nylon membrane blotted with Breast total RNA and MCF-7 total RNA, and detection of the probe with anti-DIG-AP antibody and chemiluminescent AP-substrate.